Will your child be a doctor this Halloween? Halloween costumes are a serious business to some children. While often they enjoy portraying a movie or cartoon character, there are some who grow out of that but aren’t ready for the super scary costumes yet either. Real life personas make a fun and distinguished solution to that. Astronaut, fire chief, nurse, so many good options, I’m sure you can think of others. And what could be more distinctive than a doctor! Not only is it a recognized costume, but it’s also a lot of fun to put together. Plus it is a costume that can used so often, worn everyday while your child plays. What Makes a Doctor’s Costume? The first item you need is a set of scrubs. Scrubs are so comfortable to hang out in or sleep in. They also are a perfect outfit for a dress up career day at school. Add to all that the equipment that makes the outfit shine. A stethoscope that actually works, glasses, a doctors bag to hold everything, and you have a costume they will enjoy for months and possibly years. We’ve all seen doctors and nurses too, running–or at least walking quickly–through the halls of a hospital. And when preparing for surgery you will see them booties and all. The outfit below come with booties, mask, hat, and scrubs. Your child will be so well equipped, he/she might be mistaken for the real thing. It’s so versatile, totally comfortable, and fun! The clothes worn are durable and washable–actually scrub fabric. If it’s cold, you can easily wear a long sleeve t-shirt beneath the scrubs for warmth. 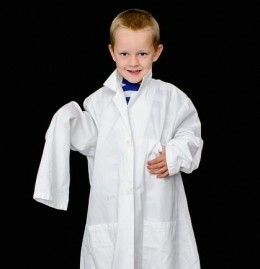 The lab coat has pockets to hold light sticks and any essentials.It’s a fun, easy costume that fits girls or boys. I bet they will even make a splash at a hospital if they stop by. A gentle color for girl or boy, restful for all their patients to look at. It does come in other colors though, as you can see from the pink set shown in the picture. You can click through to see. Various sizes too are available for most of the outfits. What a comfortable costume idea! The next item you may want to add is an official lab coat. That really says ‘doctor.’ This one is washable, just like the real thing. Love the pocket on the coat too. For safety’s sake they will hold a nightstick or two, along with other treasures your trick-or-treater may want along. The great thing about a costume like this is that all of the outfits are washable. Once Halloween is over, your child will be able to play or hang out in this costume for a long time. Everyone loves to wear scrubs. I doubt kids are an exception to that. Made by Aeromax, they are very well made and durable, just like regular adult scrubs. Most of the outfits come in varying sizes. When you click through you will see them. Some have other colors available too. For the polished look of a doctor, you must have a lab coat. This will be just their size. The pockets will be handy for Halloween night, don’t you think? In addition to the outfit, a stethoscope is essential for the doctor look. This one actually works–fun! I can picture the little ones going from person to person before they discover the fridge makes noise, the cat has a heartbeat (watch those claws). They might even try to listen through the walls. What else could your doctor use? Since the doctors wearing these costumes are liable to be a bit short to be believable, I’d definitely suggest a pair of glasses. Not only will they make your child look older, but they will also make them look even more intelligent than they already are. The maturity and wisdom that comes with glasses won’t be lost on their peers. We’ll have them operating in no time. An official looking doctors bag might be handy to have along. Not only can medical equipment be kept inside, it could also hold candy. That might help keep them from listing to one side as their trick or treat bag gets heavy. It could be big enough to use for their bag, depending how many homes are fit in. One last benefit…they can keep all of the play time costume in the bag for your convenience. Either way, awesome article. Keep up the great work :D.
These costume ideas are so cute! My kids’ aunt worked in a hospital and provided them with surgical scrubs, masks, and more. I have great memories of them dressed up, examining their stuffed animals with such serious expressions on their faces. Adorable!